Okay, I’ll admit it, I’m a little nosey! One of the reasons I like reading blogs is that I get a little snapshot of your life, whether you’ve posted a photo of your kitchen, a review of the latest cookbook you bought, or a photo of your lunch, I’m interested! Wait… do I sound creepy? Whatever, no take backs! Today I’ve been super into reading about what you’ve been eating for lunch and where you’ve been eating it. Sasha from One Small Vegan talked about her love of wraps today and she showed us this fine example. 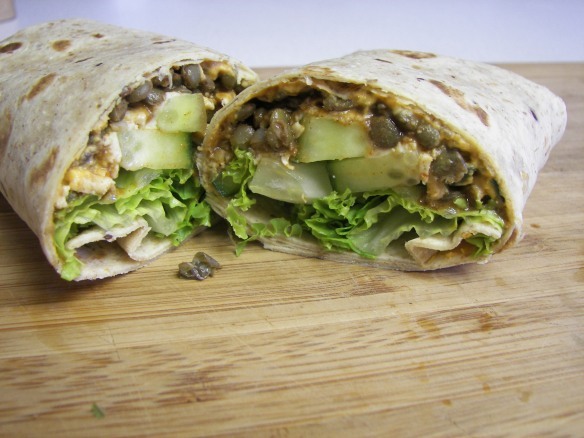 I’d come over and eat the hell outa this tasty looking Lentil, Daiya, Hummus, Cucumber & Lettuce Wrap anytime! 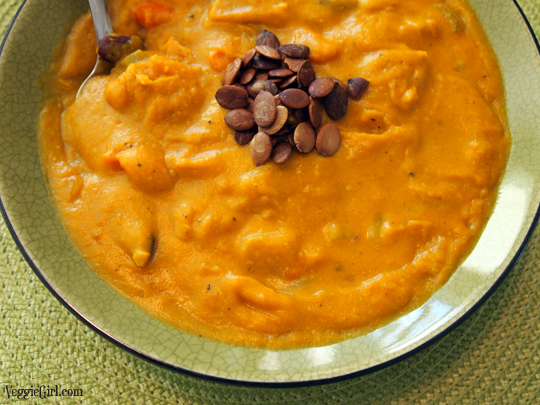 Another person who ate their lunch at home today was Dianne over at Veggiegirl, she whipped out some leftover Curried Pumpkin Soup which looks just perfect for the cooler Autumn weather. 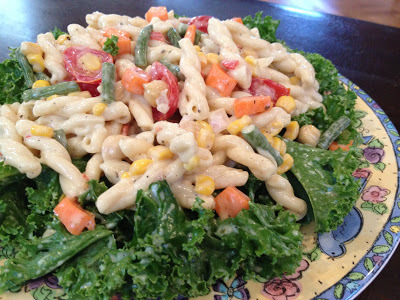 Lisa from Vegan Culinary Crusade made this healthy looking lunch-to-go. 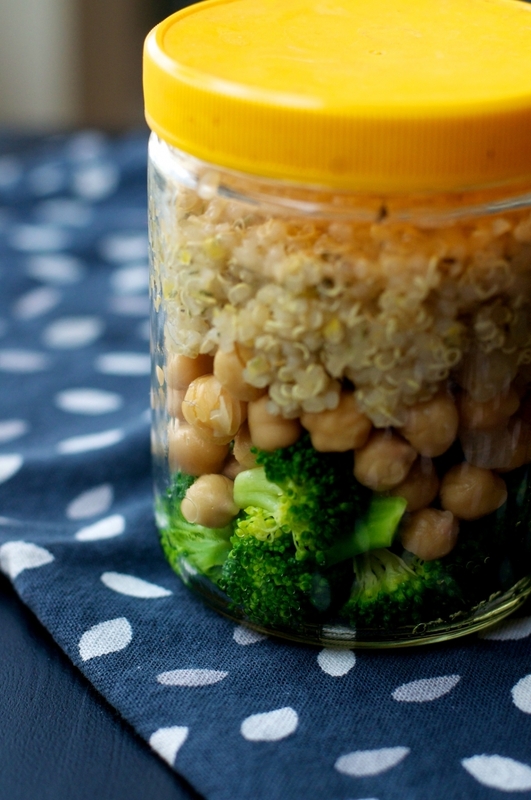 This Broccoli, Chickpea Quinoa Salad includes my favourite veg and I love the idea of layering everything up like this, so pretty! 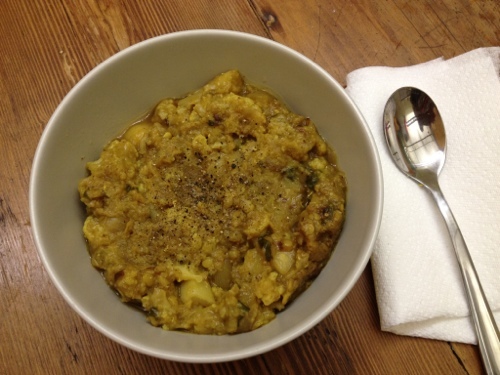 Helen from Vegtastic took the delicious Red-Lentil Cauliflower Curry from Veganomicon to work today. I bet this made the break room smell deeelicious. I can’t quite work out whether this was a lunch, dinner or brunch but judging by the lighting I’ll guess lunch, erm, it fits in better with my theme okay?! This veggie filled pasta salad served on a bed of kale from A Soy Bean is definitely something I’d happily scoff down at lunchtime. Lazy Smurf is lucky enough to live in one of my all-time favourite places, Austin. 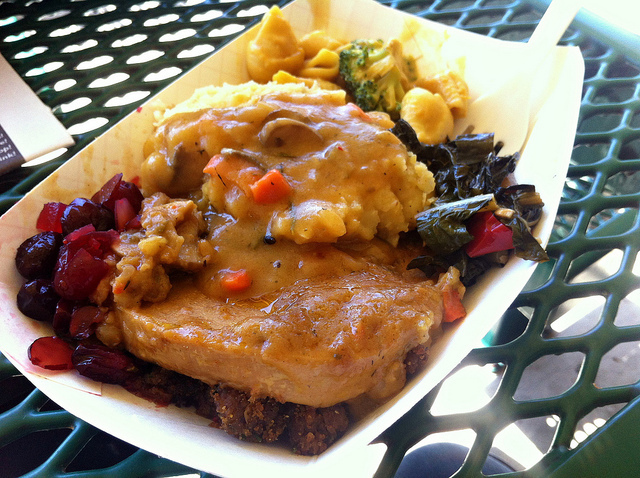 Today she grabbed a Thanksgiving Plate from the hot bar at Wheatsville and it looks epic. You can get this any Wednesday in October and if you’re lucky enough to live within, say, 6 hours of Austin please go and eat this for me! Last but by no means least Vegan Food Rocks is lucky enough to work right by Spike’s Junkyard Dogs in Boston meaning that she can get a great vegan lunch to go, and, to make things even better, if there’s a birthday in the workplace the boss buys everyone lunch!! Whaaat?! I wanna work with you grrrl! 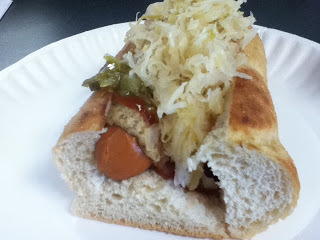 This Irish Setter Dog topped with Sauerkraut & Ketchup with extra House Mustard and Relish looks right up my street. Wow! Yum! Great ideas, and I DO live 6 hours from Austin. Next trip down there, we will certainly be checking Wheatsville out. Thanks for the great suggestions. It makes me want to have lunch again right now at 11:00 p.m.! This is a great roundup. Lunches are great and I always like to see other ideas. Jojo, really, this is just too much goodness., I need a clone of myself to cook for me when I’m tired (like now!). Thanks for a great lunch round-up! What’s up, all the time i used to check blog posts here in the early hours in the dawn, as i like to learn more and more.